Prof. Surinder Singh (in the centre) delights the audience with sounds from forgotten musical instruments that defined Sikh spirituality. Photo courtesy of Harbirz Inc. When a regal looking Sikh in an azure blue Sherwani began to play few bars of music on the Saranda, it was powerful and emotional experience. The Saranda, an ancient Indian instrument, dating some 500 years or more, had all but disappeared from our society. 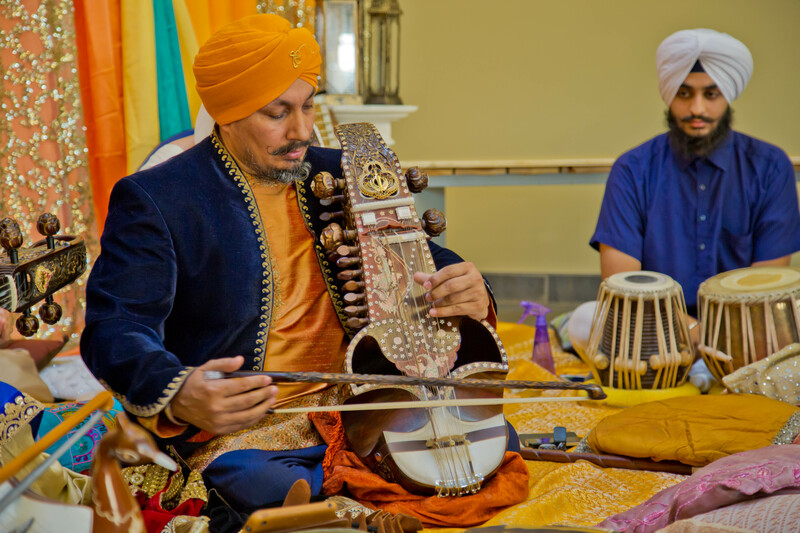 The string and skin instruments such as rabab, Jori (a tabla-type drum), taus, and dilruba were an integral part of the Kirtans sessions delivered by Sikh spiritual leaders like Guru Arjun, Guru Gobind Singh and others. Their pure notes travelled across the room in perfect resonance. Remember, it was an era devoid of mics, expensive sound systems and amplifiers. Music and prayer went hand-in-hand and an enlightened soul was the byproduct of this union. Slowly, over the years, the ubiquitous harmonium, nudged these vessels of sublime sounds out. A few of instruments from the bygone era found their way into British museums where they languished in anonymity until a musician on a quest to decipher the meaning of the Sikh Shabds (scriptures) stumbled upon them. Surinder Singh, popularly known as Prof. Surinder Singh, founder, director of Raj Academy, a United Kingdom (U.K.)-based organization, with branches here in Toronto, has devoted his life to the revival of the Sikh musical heritage. His students learn Gurmat Sangeet and Naad (sound) yoga. Prof. Surinder Singh seen here playing the saranda. The ancient musical instrument which had faded into obscurity has been revived by Surinder Singh. When Surinder saw the beautiful instruments tucked away in museums, he thought it was sacrilege that “his music was in prison.” So, he liberated them. At 13, while learning Indian classical music, a young Surinder questioned his gurus – Pandits Kharaiti Lal Tahim and Mahant Ajit Singh, on the underlying meanings of the raagas and scriptures and how they mattered. His wise teachers told him to embrace meditation or else, they said he would have to make room for medication. Those words didn’t hit home, until an accident at 19 incapacitated him physically and psychologically. It was then he understood music’s power to heal the body. Surinder Singh searched and found two individuals in India that could carve wood to perfection and install natural gut strings into rababs and sarandas. much like the way other craftsmen did more than 500 years ago. When coaxed, the instruments, under a skilled musician’s fingers or the tanti saaj as the people that master the Gurumat Sangeet are known, produce sounds that soothe the restless mind create a spiritual awakening. Singh says listening to the tanti saaj deliver the ragas can transport a soul into a state of bliss. I can attest to that. I heard few bars and felt the tension seep away as the music percolated my psyche. 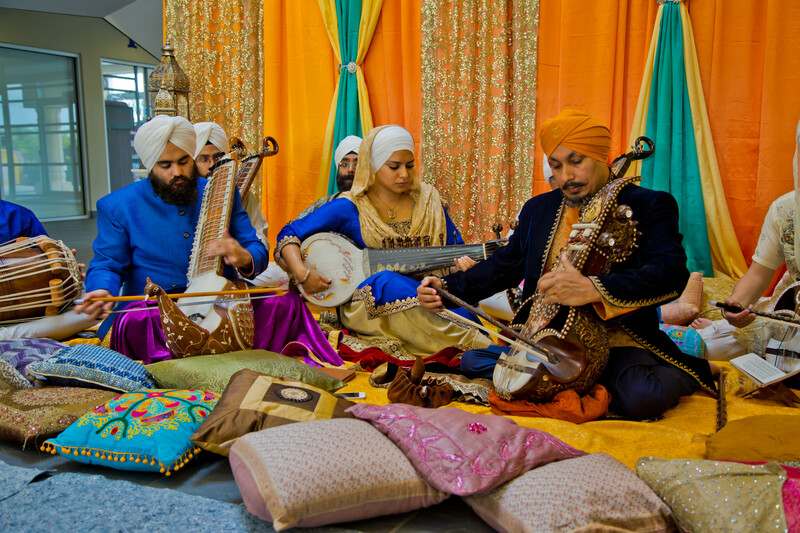 Students of Raj Academy showcase ancient musical instruments that defined Sikh spirituality. Jasvir Kaur, a student of the Raj Academy and a rabab player, said music became her salvation when the death of her brother pushed her into an abyss of misery. 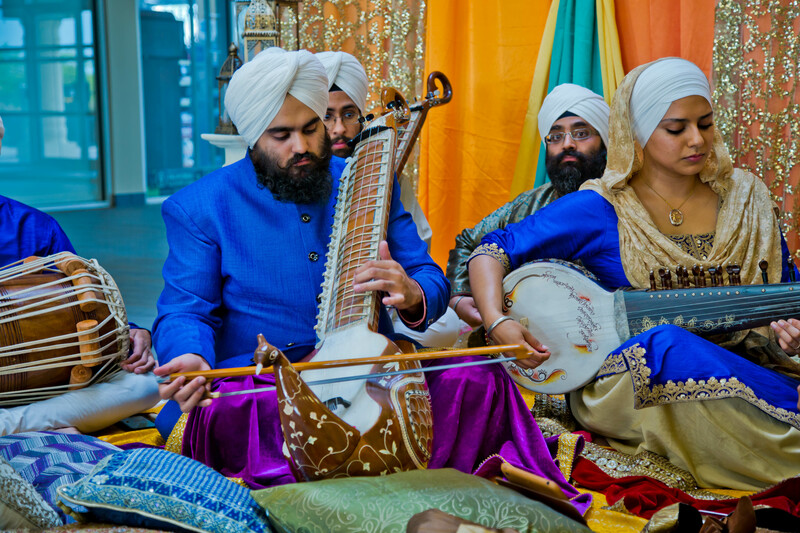 The Sikh rabab or Firandia rabab is a lute-like instrument and is a precursor to the Sarangi. It has a deep, soulful tempo. It was the choice instrument of Guru Nanak or the “singing guru” as Jasvir calls him. For a sample of the music, watch the video below. You will be lifted. I guarantee.